The dining experience on Rotterdam begins with the two-deck La Fontaine Dining Room, which features floor-to-ceiling windows at the rear of the ship, and a sweeping double staircase. While Holland America's food hasn't always been the line's strong point, we see signs of improvement onboard Rotterdam. "As You Wish Dining," the line's relatively new evening set-up has been added to Rotterdam. Essentially, this more flexible approach offers passengers a choice of traditional set-seating at dinner time or an open seating arrangement. One level of La Fontaine is devoted to the traditional early or main seating scenario, the other is open from 5:15 - 9 p.m. Passengers can either make reservations -- or just walk in. 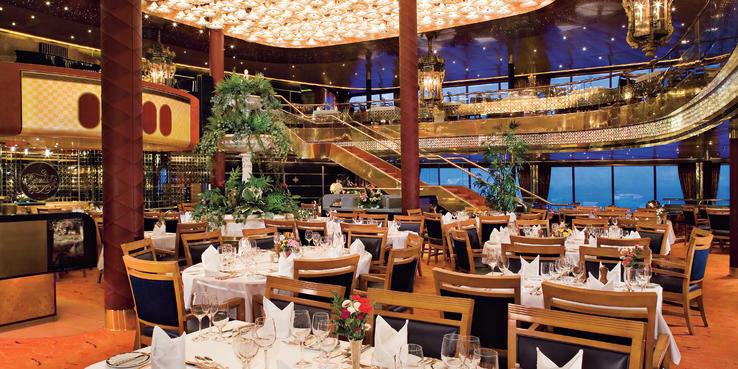 As is typical with Holland America, there are many tables for two. If the ship isn't sailing full, tables for four along the port and starboard windows are transformed into wonderful tables for two. The menus in La Fontaine strike a nice balance between contemporary cuisine and more traditional fare. Each lunch and dinner menu features several creative choices involving unique preparation, sauces, or pairings. But the menus offer plain options as well, including "From the Grill" items like salmon, prime rib, and more, as well as lighter cuisine and a vegetarian choice. Special diets can be accommodated by La Fontaine chefs with 30 days notice. The wine list is outstanding and the wine stewards are knowledgeable without being overbearing (there's a four- or six-wine "Wine Navigator" package of moderately priced and varied bottles that many passengers enjoy). La Fontaine also offers a 22-dish, vegetarian-only menu for lunch and dinner; it consists of appetizers, salads, soups and entrees. Options include dishes like portobello mushroom and chipotle quesadillas, Vietnamese vegetable spring rolls or spicy lentil and garbanzo salad. The Pinnacle Grill is a huge hit with Rotterdam passengers. The menu was once Northwest-themed, but it now feels more like continental steakhouse fare. The menu starts off with appetizers like spicy chicken coconut soup, lobster bisque, Dungeness crab cakes and Caesar salad. Entrees include seafood -- lobster tail, black cod, salmon -- but the real star is the grill, with everything from porterhouse and filet mignon to veal chops and lamb. Lobster macaroni and cheese is listed as an entree, but it's a bit rich; the appetizer-sized portion is just right. Make room for dessert, which includes baked Alaska, served with Ben & Jerry's Cherry Garcia ice cream, and the Grand Marnier chocolate volcano. There's a $35 per person fee. The Lido Restaurant is a nice dining surprise. The breakfast and lunch offerings are fairly standard at the cafeteria-style restaurant, though excellent omelets for breakfast and occasional lunchtime Indonesian "rice tables" or Indian curry stations provide unusual choices. At dinner, the Lido transforms into a bistro that is quite popular with those who don't always want to get dressed up on more formal nights. Just outside, a self-serve stand is open practically all day, with choices like hamburgers, hot dogs and Mexican fare for a more casual meal. Aft of the Lido is an outdoor pizza counter called Slice. One section of the Lido has been outfitted with a slightly different decor, and at dinner (served from 5:30 p.m. to 9:30 p.m.), this area becomes Canaletto, an alternative Italian dining experience. Reservations are suggested, but walk-ups are accepted on a space-available basis. There is a $15 fee to dine there, and the menu is the same each night. The menu starts with antipasti -- choose from grilled veggies, balls of mozzarella cheese and Italian deli meats. Next is a choice of appetizers (salad, minestrone soup or seafood soup), and entrees include assorted pasta dishes, Veal Milanese, Chicken Marsala Scaloppini and Cod Putanesca. At the end of the meal, every table receives a dish of cotton candy to share, in addition to a choice of desserts. The food and experience is quite good for a no-fee onboard eatery. Holland America offers 24 hour room service.